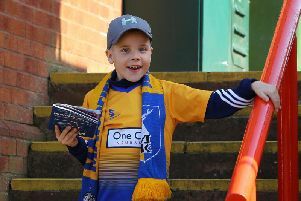 Mansfield’s draw with Wycombe Wanderers on Saturday was a slightly disappointing game. The Stags had a good opening 15 minutes but were then really poor for the last 30 minutes of the first half, before improving in the second half and finishing very strongly. The Stags went behind for just the fourth time this season in the League, a remarkable statistic perhaps given we are more than a quarter of the way through the season. But unlike the three previous occasions, Mansfield came from behind to pick up a point with a late equaliser. In the end the Stags were frustrated not to win the game as Wycombe’s outstanding goalkeeper, Jamal Blackman, 6ft 6ins and remarkably agile, on loan from Chelsea, and according to The Sun newspaper earning £13,000 per week from Chelsea, pulled off a stunning save in stoppage time to deny Darius Henderson a winner with a header that had goal written all over it. Jack Thomas crossed from the right, Henderson headed towards the right corner of the net and Stags fans were out of their seats ready to celebrate as keeper Blackman, somehow clawed it away. It was probably the best save I’ve seen at Field Mill since Rod Arnold against Cambridge in 1975. Ten minutes before that, Mansfield had equalised with Matt Green scoring his 80th goal in League and cup competitions for Mansfield. He is sixth in Mansfield’s goalscoring list of players since Mansfield first joined the Football League in 1931. Green began on the bench against Wycombe for the fifth game running but would have started had he not been ill earlier in the week. The goal came when Clements was hauled down on the edge of the centre circle. Collins took the free kick quickly to Benning, who crossed high from the left, Henderson headed on and Green fired in from 12 yards - good strength from Henderson and clinical from Green. After the game Wycombe’s boss Gareth Ainsworth was highly critical of the referee, including citing that the foul on Clements in the build-up to the goal was not a foul, but video evidence shows it was a very clear foul. In the first half, Mansfield had a good opening after 15 minutes, and should have been in front when Pat Hoban did well to win the ball with a sliding challenge. Danny Rose slid a good ball forward back into his path, Hoban rounded the keeper, but Wycombe midfielder Rowe got back to clear his shot off the line. But then Mansfield were poor for the rest of the half with Wycombe twice sounding a warning as Scott Shearer saved well from Gape, and then Cowan-Hall just failed to turn in a Paul Hayes clip to the far post, before they deservedly took the lead. The disappointing Gobern was dispossessed and some crisp passing from Wycombe put Matt Bloomfield clean through on goal, and he fired past Shearer from 14 yards. The second half was a different affair, though, as Mansfield dominated. The introduction of Green and the returning Jack Thomas gave Mansfield more potency going forward. There were several chances to equalise, including Bennett heading just wide from Benning’s corner, and then Benning’s shot with the outside of his left foot bringing a terrific save from Blackman. And then after Green did equalise, Benning’s free kick was saved by Blackman before that world class save by the keeper from Henderson. Overall this was slightly disappointing from Mansfield, but positives to take included the second half performances of Green, Thomas, Henderson, and Benning, who was my man of the match. The Stags remain a point outside the play-offs ahead of next Saturday’s visit to Luton.